I met with the Nova tribe, who were surrounded by mystery. July 26, 2012! Pantheon’s story will unfold. max , is that kaiser class a warrior race? No, it’s not. Where do you see an info that says that I’m wrong? well the fact that u said “magician” so you’re referring to the first image, unfortunately its KAISER, nevertheless those other presumption of yours are merely to be determined. I was hoping for all 5 classes, not just 3:( Maybe they will be here in the future! For a warrior that uses fire, Kaiser looks pretty cool-headed. The Top Right one reminds of Spyro! Isn’t one of the commanders of the Black Mage a Nova? Max where can I find orbs for Luminous? I didn’t got it at any job advancement, and I’m 4th already. The lower 2 are mages, and the last one is the bad guy. Wow! A whole new Branch of Dragon Related jobs! Can’t wait to see the 65xx job ! ….Kaiser screamed while dropkicking the Black Mage into a pit. Magnus mustav betrayed the nova races , and the swords in the last inkwell diary must be used by the Kaiser class I KNEW IT!!!!!!!!! This. It’s wayyyyyyyyyyyy too big. Wishing they’d make a music-based class; a class where it would be necessary to hit the right keys (rhythm or pitch) in order to increase damage or something. 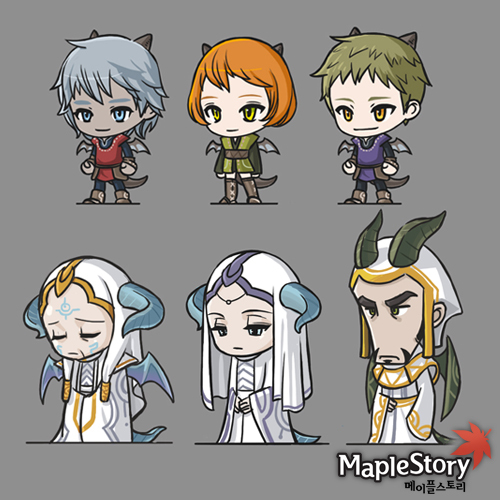 I say the elders are the classes in order from left to right, warrior, mage and archer. the second one i am pretty much sure it is a mage because of that thing on her head. Who can mistake that for any other job than a mage? When release the kaiser story!? i cannot wait for it! Dunnoe which class will be the Hero whose kill the black mage! Pantheon is going to ult KMS! Hey, Max! Yesterday, i saw the “Phantom’s Infiltration” video, and i notice that some Nova people appears in the video, like here http://imageshack.us/f/827/novclases.png/ , http://imageshack.us/f/40/novclases2.png/ and http://imageshack.us/f/694/novaclases3.png/ here. They are 5 in total, maybe gonna get 1 for each adventurer job? whoa. how in the world can anyone spot that?????????? so the middle girl is angelic burster. So whats the last one?? what do u think Max? Inkwell’s Secret Diary – Magnus’s Surprise Attack! kMS ver. 1.2.165 – Choice of Light and Darkness!